A permanent resident restricted primarily to southeastern Minnesota. Broadly distributed across the eastern United States. The northern periphery of the Tufted Titmouse’s breeding range extends from southeastern Minnesota east to Maine. Along the Atlantic coast it stretches from Maine south through much of Florida and west through eastern Texas. Highest breeding densities are found in southern New England and the southeastern states south of the Ohio River valley (Figure 1). Much of the population data that are available for the Tufted Titmouse (including that illustrated in Figure 1) combine information for both the Black-crested Titmouse and the Tufted Titmouse, which were recognized as separate species in 2002. The Black-crested Titmouse is restricted to central Texas and northeastern Mexico. A permanent resident throughout its breeding range. Data suggest that some birds occasionally move south in the fall; movements may be confined largely to juveniles. Omnivorous; employs a variety of foraging techniques to feed in trees and on the ground. During the fall and winter, the birds also cache food such as acorns and sunflower seeds, placing them under loose bark or in cracks and furrows of tree limbs. Secondary cavity nester; uses natural cavities, old woodpecker cavities, and nest boxes. Breeding distribution and relative abundance of the Tufted Titmouse in North America based on the federal Breeding Bird Survey from 2011 to 2015 (Sauer et al. 2017). Interestingly, the first documented nesting was much farther north, at Marine on St. Croix, Washington County, in 1943 (Edgar 1943). Nesting reports from southeastern Minnesota soon followed. In the summer of 1946 Mary Lupient reported that two pairs of titmice nested “last spring for the second time” in Rushford, Fillmore County, suggesting that the second confirmed nesting was in the summer of 1944 (Lupient 1946). Nearly 30 years later, Green and Janssen (1975) considered the Tufted Titmouse to be a permanent resident in southeastern Minnesota, extending northward to Washington County in the east and Stearns County in the west. Winter records extended even farther north into northeastern and northwestern Minnesota. The Tufted Titmouse is well known for its population fluctuations (Cutright et al. 2006), and a few years later, Janssen (1987) reported that the bird had actually retreated southward. “From the 1940s to the mid-1970s this species expanded its breeding range northward in the state to where it was seen regularly in Hennepin County. Since the mid-1970s it has retreated southward from this area.” Although it was still regularly observed in the southeast corner of the state, it was no longer observed at sites during the summer months in the greater Twin Cities metropolitan region. Janssen (1987) did include a distribution map that delineated 4 counties where nesting had been confirmed since 1970: Houston, Olmsted, Ramsey, and Wabasha. The Minnesota Biological Survey conducted most of its work in east-central and southeastern Minnesota in the 1990s. During this time, they reported a total of 16 breeding season locations of Tufted Titmice; all were restricted to Houston, Fillmore, and southern Olmsted Counties (Minnesota Department of Natural Resources 2016). The MNBBA documented breeding season reports from 29 of the surveyed atlas blocks and from 21 of the priority blocks. Breeding was confirmed in only 3 blocks (Figures 2 and 3; Table 1). The birds were observed in 14 counties and were reported as far west as a site in Brown County along the Minnesota River valley, and as far north as Isanti County in east-central Minnesota. Breeding was confirmed in two counties: Olmsted and Wabasha. Given the increasingly warm winters that Minnesota has experienced in the past decade, it is not surprising that the Tufted Titmouse is again expanding its range in the state. Similar population fluctuations have been documented in Wisconsin. First sighted in the state in 1900, the species steadily increased in numbers and distribution through the 1960s. Populations became well established along the Mississippi and Wisconsin Rivers in southwestern Wisconsin and along the Chippewa River in Eau Claire and Chippewa Falls. Beginning in the 1960s, however, numbers slowly declined and “bottomed out in 1980,” only to begin a slow and gradual recovery in succeeding years (Cutright et al. 2006). Although the Tufted Titmouse is well known for experiencing regular population fluctuations, it also is widely cited as an example of a species that has expanded its range northward in response to a warming climate. Over a period of nearly 100 years, the species steadily expanded the northern edge of its distribution nearly 500 miles in New England and 300 miles in the Great Lakes region (Bird Source 2016). This expansion is best illustrated by data collected by the National Audubon Society’s Christmas Bird Count, which began surveys in 1901. Even accounting for higher levels of citizen participation in the annual count over the years, the northward movement of titmice is unmistakable (Figures 4 and 5). Close examination of these figures reveals that the northward expansion from northern Illinois into southern Minnesota has been relatively restrained compared to the extensive movements in New England. Indeed, biologists believe the harsher winters in the Upper Midwest have been a limiting factor, often pushing the birds south until there is a string of warmer winters that again facilitate northward movements (Bird Source 2016). A warmer climate is considered the primary driving factor responsible for the Tufted Titmouse’s northward expansion, but the popularity of backyard bird feeding has likely contributed to the observed changes as well. In the northeastern United States, forest succession on abandoned farmland is also cited as a contributing factor (Ritchison et al. 2015). Breeding distribution of the Tufted Titmouse in Minnesota based on the Breeding Bird Atlas (2009 – 2013). Summary statistics of observations by breeding status category for the Tufted Titmouse in Minnesota based on all blocks (each 5 km x 5 km) surveyed during the Breeding Bird Atlas (2009-2013). Summary statistics for the Tufted Titmouse observations by breeding status category for all blocks and priority blocks (each 5 km x 5 km) surveyed during the Minnesota Breeding Bird Atlas (2009-2013). Christmas Bird Count circles where Tufted Titmice were reported (red dots) in the 10-year period from 1901 to 1910 (Bird Source 2016). 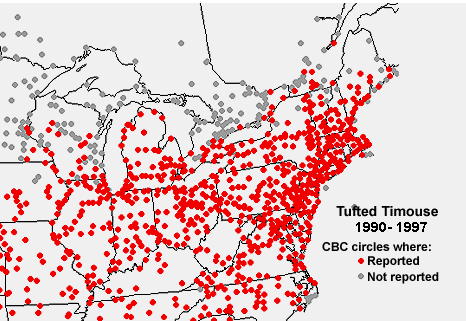 Christmas Bird Count circles where Tufted Titmice were reported (red dots) in the 10-year period from 1990 to 1997 (Bird Source 2016). Generally inhabitants of mature deciduous forests, titmice are occasionally found in mixed coniferous and deciduous woodlands (Figure 6). Their general requirements appear to be stands of large trees with a relatively open understory and a dense canopy. Because mast is an important winter food item, oaks and other mast-producing species are an important element as well. These features are often found in lowland hardwood stands, which are a common haunt of the species. Although they may use a variety of human-altered habitats, such as parks and orchards, they reach their highest breeding densities in large tracts of unfragmented forest (Cutright et al. 2006). Typical breeding habitat of the Tufted Titmouse in Minnesota (© Gary T. Seim). Data from the federal Breeding Bird Survey (BBS) have been used to generate an estimate of the Tufted Titmouse’s North American population at 11 million breeding adults (Rosenberg et al. 2016). The statewide estimate for Minnesota is a mere fraction of this number, at less than 100 birds (Partners in Flight Science Committee 2013). Tufted Titmice are rarely detected on BBS routes in Minnesota. Between 1967 and 1970, only 4 birds were reported, between 1971 and 2005, only 2 birds were reported; and between 2006 and 2016, 6 birds were reported. Although wide fluctuations are expected on the edge of a species’ range, the results provide further evidence of the species’ retraction from much of its Minnesota range beginning in the mid-1970s and its gradual reoccupation several decades later. Survey-wide data from the BBS’s beginning in 1966 clearly illustrate the species’ steady and significant increase, averaging 1.08% per year (Sauer et al. 2017). Although data in Minnesota were insufficient to predict population changes, southeastern Minnesota is included within the Prairie Hardwood Transition Region, where populations also have undergone a significant annual increase, of 1.35% per year. The increase is significantly higher in the 10-year reporting period from 2005 to 2015, averaging 3.83% per year (Figure 7). Factors responsible for the increase, noted earlier, include an increase in winter bird feeding as a recreational activity, the maturation of deciduous forests in the northeastern United States, where the species’ range expansion has been the greatest, and warming climates (Ritchison et al. 2015). 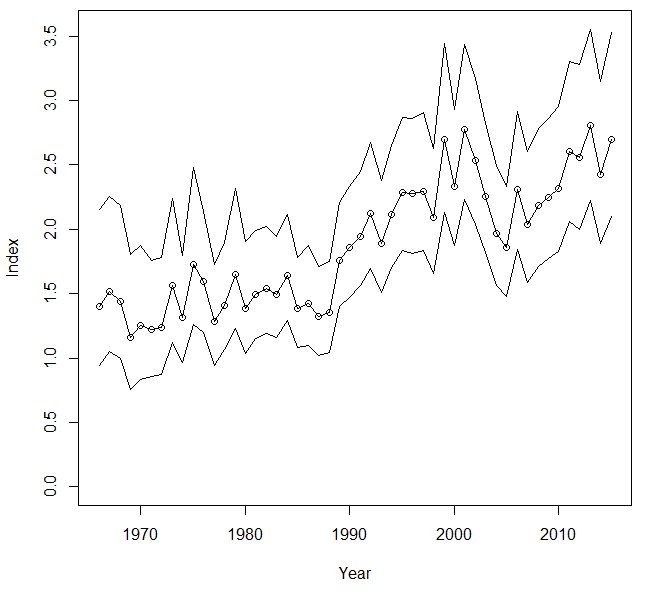 Breeding population trend for the Tufted Titmouse in the Prairie Hardwood Transition Region for 1966–2015 based on the federal Breeding Bird Survey (Sauer et al. 2017). With a relatively low Continental Conservation Score of 7/20, the Tufted Titmouse is not the focus of any targeted conservation effort at either the national or state level (Rosenberg et al. 2016). It is one of a few species to be experiencing a clear benefit from warming temperatures. At the local scale, factors that may limit populations include the availability of cavity trees, annual variability in mast production, severe winters, and competition with other cavity-nesting species (Cutright et al. 2006). With warming climates, it seems likely that residents north of Minnesota’s far southeastern counties may once again be entertained by this lively and inquisitive little bird in the not too distant future. Edgar, Marjorie. 1943. “Tufted Titmouse Nesting in Minnesota.” Flicker 15: 35. Lupient, Mary. 1946. “Tufted Titmice in Minnesota.” Loon 18: 42.